Image caption The ferry left the island of Nonouti ahead of a 260km (160 miles) journey to Betio. 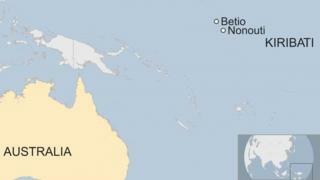 Rescuers are searching for a ferry with an estimated 50 people on board after it went missing in the Kiribati Islands. The MV Butiraoi departed from Nonouti island on 18 January on a voyage that was expected to last two days. But it was reported missing on Thursday night and officials from New Zealand and Fiji are now working to find it. The vessel is a 17.5m (57ft) wooden catamaran that transports passengers between the islands. The Rescue Coordination Centre of New Zealand (RCCNZ), which is assisting with the search, said the ferry left Nonouti ahead of a 260km (160 miles) journey to Betio, which is the country's main port. It was expected to arrive on 20 January but the ship, which has a dark blue hull and yellow accommodation quarters, has been missing for seven days. The RCCNZ said a New Zealand Airforce P3 Orion was deployed as part of the rescue operation. Senior Search and Rescue Officer John Ashby said: "We are doing everything we can to locate this ferry and its passengers." "We understand the vessel underwent repairs to its propeller shaft just before it departed. This may have contributed to problems navigating the journey," he said. Mr Ashby added that New Zealand Maritime Operations Centre and Kiribati Tarawa Radio station are broadcasting for sightings on maritime radio. The 33 atolls that make up Kiribati occupy a vast area in the equatorial Pacific. Many of the atolls are inhabited; most of them are very low-lying and at risk from rising sea levels as a result of global warming.